The archetypal characteristics of pirates in popular culture largely derive from the Golden Age of Piracy in the late 17th and early 18th centuries, with many examples of pirate fiction being set within this era. Vikings, who were also pirates, took on a distinct and separate archetype in popular culture, dating from the Viking revival. The first major literary work to popularise the subject of pirates was A General History of the Robberies and Murders of the most notorious Pyrates (1724) by Captain Charles Johnson, It is the prime source for the biographies of many well known pirates of the Golden Age, providing an extensive account of the period. 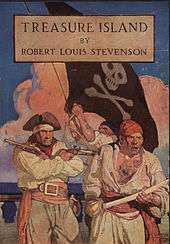 In giving an almost mythical status to the more colourful characters, such as the notorious English pirates Blackbeard and Calico Jack, the book provided the standard account of the lives of many pirates in the Golden Age, and influenced pirate literature of Scottish novelists Robert Louis Stevenson and J. M. Barrie. While Johnson's text recounted the lives of many famous pirates from the era, it is likely that he used considerable licence in his accounts of pirate conversations. 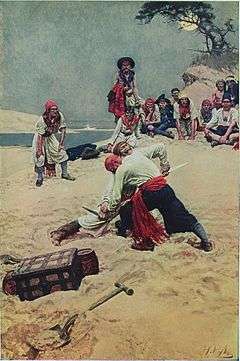 Stevenson's Treasure Island (1883) is considered the most influential work of pirate fiction, along with its many film and television adaptations, and introduced or popularised many of the characteristics and cliches now common to the genre. Stevenson identified Johnson's General History of the Pyrates as one of his major influences, and even borrowed one character's name (Israel Hands) from a list of Blackbeard's crew which appeared in Johnson's book. In films, books, cartoons, and toys, pirates often have an unrefined appearance that evokes their criminal lifestyle, rogue personalities and adventurous, seafaring pursuits. 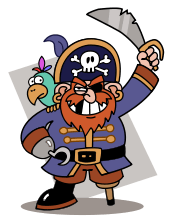 They are frequently depicted as greedy, mean-spirited, and focused exclusively on fighting enemy pirates and locating hidden treasure. They are often shown wearing shabby 17th or 18th century clothing, with a bandana or a feathered tricorne. They sometimes have an eye patch and almost always have a cutlass and a flintlock pistol, or some other sword or gun. They sometimes have scars and battle wounds, rotten or missing teeth (suggesting the effects of scurvy), as well as a hook or wooden stump where a hand or leg has been amputated. Some depictions of pirates also include monkeys or parrots as pets, the former usually assisting them in thieving goods due to their supposed mischievous disposition. Stereotypical pirate accents are modeled on those of Cornwall, South Devon or the Bristol Channel area in South West England, though they can also be based on Elizabethan era English or other parts of the world. Pirates in film, television and theatre are generally depicted as speaking English in a particular accent and speech pattern that sounds like a stylized West Country accent, exemplified by Robert Newton's performance as Long John Silver in the 1950 film Treasure Island. A native of the West Country in south west England from where many famous English pirates hailed, Newton also used the same strong West Country accent in Blackbeard the Pirate (1952). 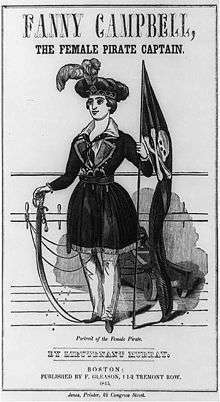 Historical pirates were often sailors or soldiers who'd fallen into misfortune, forced to serve at sea or to plunder goods and ships in order to survive. Depending on the moral and social context of a piece of pirate literature, the pirate characters in that piece may be represented as having fallen, perhaps resembling a "respectable" person in some way. Pirates generally quest for buried treasure, which is often stored, after being plundered, in treasure chests. Pirate's treasure is usually gold or silver, often in the form of doubloons or pieces of eight. Pirates also play a central role in the parody religion of Pastafarianism. Established in 2005, Pastafarians (members of The Church of the Flying Spaghetti Monster) claim to believe that global warming is a result of the severe decrease in pirates since the 1700s, explaining the coldness associated with winter months that follow Halloween as a direct effect of the number of pirates that make their presence known in celebration. Redbeard (1959 onwards), a Belgian comic. A group of hapless pirates, in themselves parodies of the characters of Redbeard, often run into Asterix and are subsequently beaten up and usually sunk. "Pirate film" redirects here. For copyright infringement, see film piracy. The 1950 film adaption of Treasure Island, as well as the 1954 sequel Long John Silver, both starring Robert Newton, are considered highly influential on the modern perception of early pirates. Anne of the Indies, a 1951 adventure film loosely based on the life of Anne Bonny (Jean Peters) with Louis Jourdan and Thomas Gomez as Blackbeard. The Crimson Pirate, a 1952 adventure film, starring and produced by Burt Lancaster. The animated films of Japanese director Leiji Matsumoto include several pirate characters, including Captain Harlock and Queen Emeraldas, the best known of these pieces being Galaxy Express 999 (1977) and Space Battleship Yamato (1974). Pirates of the Caribbean: The Curse of the Black Pearl (2003), Pirates of the Caribbean: Dead Man's Chest (2006), Pirates of the Caribbean: At World's End (2007) Pirates of the Caribbean: On Stranger Tides (2011) and Pirates of the Caribbean: Dead Men Tell No Tales (2017), movies based on the popular Disneyland attraction, "Pirates of the Caribbean". Six Days Seven Nights, features piracy in the South China Sea. Musicians have long been drawn towards pirate culture, due to its disestablishmentism and motley dress. An early 1960s British pop group called itself Johnny Kidd and the Pirates, and wore eye patches while they performed. Keith Moon, drummer of The Who, was a fan of Robert Newton. Flogging Molly, The Briggs, Dropkick Murphys, The LeperKhanz, The Coral, The Mighty Mighty Bosstones, Tokyo Ska Paradise Orchestra, Bullets And Octane, Mad Caddies, The Vandals, Gnarkill, Armored Saint, Jimmy Buffett, and Stephen Malkmus have pirate-themed songs as well. Mad Jack the Pirate, produced by Bill Kopp, showed on Fox Kids in 1990s. The Comedy Central animated series, South Park aired a pirate-themed episode titled "Fatbeard" in 2009 as part of the show's 13th season. It referred to piracy in the Indian Ocean. In the episode, Cartman, believing that the classic era of piracy has returned to Somalia, heads to Mogadishu, only to be struck by the reality. Megaman Battle Network 6 a WWW member named Captain Blackbeard, an operator of Diveman.EXE who dressed as a sailor. "Barret's Privateers" is a song written by Stan Rogers popular in Nova Scotia detailing the fictional story of Elcid Barret and his privateers and their voyage on the Antelope to raid American shipping vessels. ↑ Jason Porterfield, Treasure Island and the Pirates of the 18th Century, Rosen, 2004, p. 12. 1 2 Bonanos, Christopher (2007-06-05). "Did Pirates Really Say "Arrrr"? The origin of Hollywood's high-seas slang.". Slate. Washington Post Newsweek Interactive Co. Retrieved 2007-09-16. ↑ Charles Johnson (1724), A General History of the Robberies and Murders of the Most Notorious Pyrates, pp. 411–12. ↑ Bradley, Ian (1982). The Annotated Gilbert and Sullivan. Harmondsworth, England: Penguin Books. pp. 86–87. ISBN 0-14-070848-0.